Last weekend I started another class sample using Sew Kind of Wonderful's Creative Curve Ruler. This one is for my workshop at Kaleidoscope Quilt Company in Mill Bay. I selected some Island Batik fabrics and Northcott's ColorWorks navy for the blocks. The high contrast makes the flowers 'pop' - just what I wanted. For the setting triangles I auditioned a lot of different colours but most of them seemed to eliminate the impact of the blocks. My final choice was white Toscana which has high contrast with the navy. Just the look I was going for. The workshop is on Saturday, March 12, 10 am - 3 pm. Contact the store at 778-455-4715 for more details. I am working on the quilting and finishing. 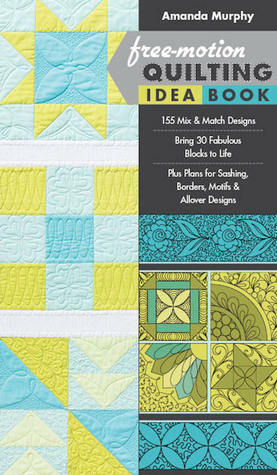 I have been referring to Amanda Murphy's new book, free-motion Quilting Idea Book. I will do a review of the book soon.